Mirage Hardwood offers the most extensive combination of colors, width, and species. 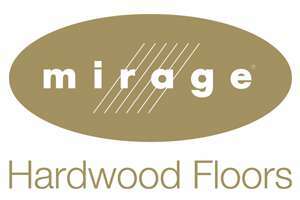 Mirage Hardwood are made in North America. Mirage Hardwood finishes are hypoallergenic and are free of VOC’s and formaldehyde. Most of Mirage Hardwood flooring is made of dry sawn, and offered in engineered, solid, and click flooring. It is known for superior resistance to scratches and stains. Mirage Hardwood is made of nanolinx, which is state of the art finish, the clearness and highly wear resistance, also it has antimicrobial agents, and finishes come in cashmere or semi-gloss. Mirage Hardwood Admiration Collection: Offers a beautiful warm look and can be installed with any application. Admiration Hardwood comes in classic, engineered, and lock, the finishes are semi-gloss and cashmere. Colors Available: Rio Urban Coast, Rio Sandy Ripples, Havana Vibrant Twilight, and Havana Distinctive Aroma. Mirage Hardwood Flair Collection: Gives a rustic look that shows all natural personality, knots, and color variations. This collection has superior protection with a DuraMatt finish. Colors Available: White Mist Natural Steam, and White Mist Morning Haze. Mirage Hardwood Sweet Memories Collection: Provides a warm, matte tone that brings elegance and beauty to the room. Handcrafted Red Oak that comes in classic, engineered, and lock. Colors Available: Treasure Cherished Memory, Treasure Ash-Gray Perfection, Tree House Cozy Refuge, and Tree House Creative Haven. McCurley’s Floor Center, Inc. have been distributing and installing Mirage Hardwood Floors and accessories including cleaners and maintenance products for over 42 years. In fact, McCurley’s Floor Center, Inc. has been certified as an Authorized Mirage Maestro Dealer, a selective network of recognized and specialized dealers offering complete and professional service. In addition to residential and commercial projects done directly by McCurley’s Floor Center, we have distributed Mirage Hardwood Flooring products to general contractors, builders, homeowners and many others. Visit our showrooms in the Northern California/Bay Area at San Ramon and Concord, CA to see our extensive line of Mirage Hardwood Flooring and promotional products.